A few weeks ago my husband came home from work with a few treasures that he picked up around his job site (he is in commercial construction). 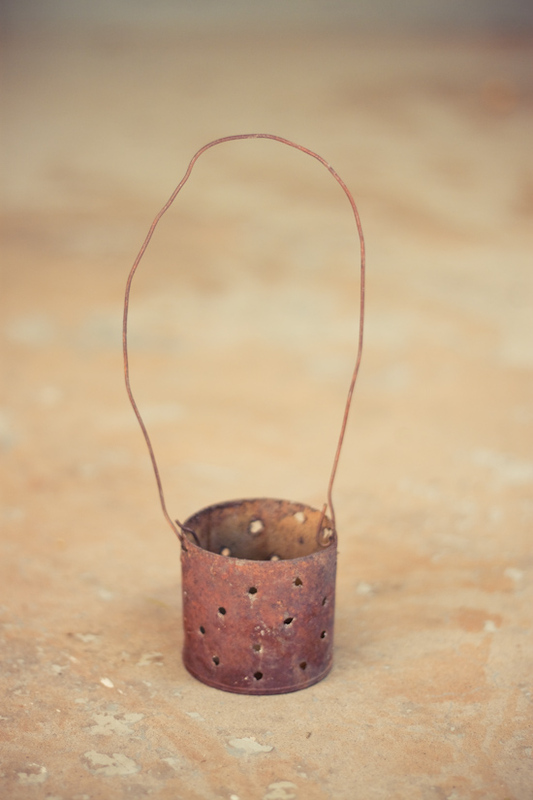 Among his assortment of treasures were a bunch of old rustic tin cans which I was immediately drawn too. I thought about all of the fun things we could make with the cans and then decided they would be great to use as accent lighting. 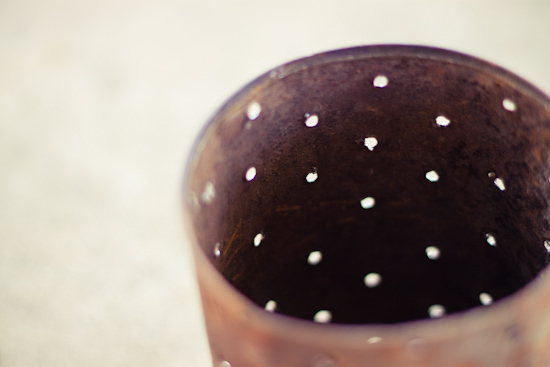 So, I had my husband carefully and randomly drill holes into each can so it would create a "star-like" effect when lit with a candle inside. Now, I realize that not everyone can just go and buy old rusted cans. 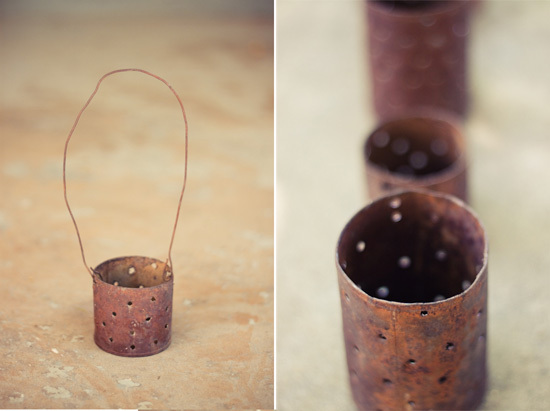 But you can create a similar look and buy the same type of cans from a craft store and just paint them or leave them plain. Infact, I was thinking that having a few of these painted in black would make an awesome centerpiece for a Halloween Table setting! Step 1. 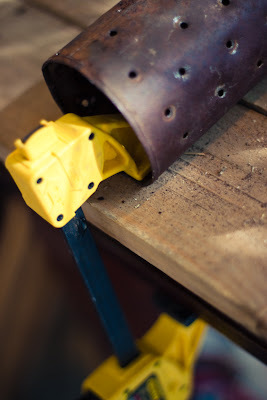 Clamp the first can to the edge of a work table or bench. Step 2. 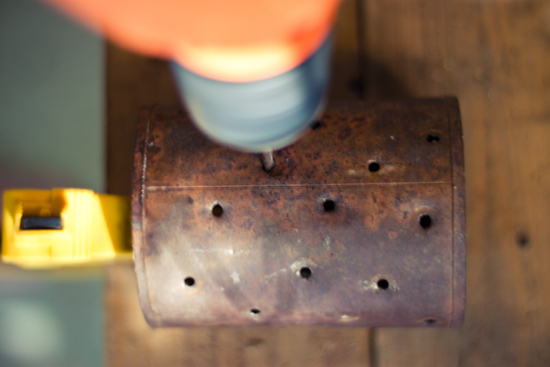 Drill small holes randomly or in a pattern around your can and file down sharp edges inside the can as needed. Step 2. If you would like to hang your can lights, drill 2 holes across from each other at the top of your can. 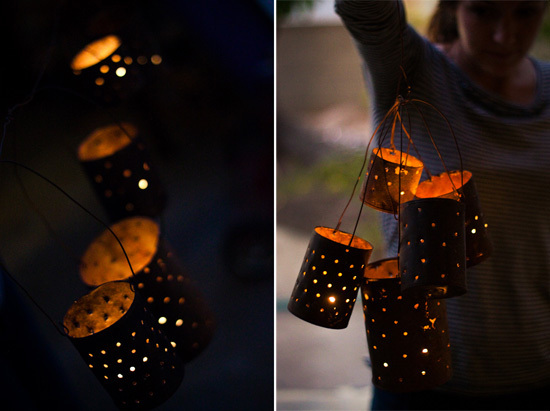 Then, loop a wire through the holes so you have something to hang the lights by. Step 3. 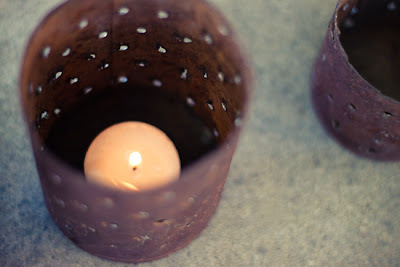 Place a small candle or tea light, place inside of each can and light (MAKE SURE TO USE A LONG STEM LIGHTER TO AVOID ANY REMAINING SHARP EDGES INSIDE THE CAN) . Display them however you wish! What a great idea!!! Kinda makes me want to ask the hubs to leave his office and head out to one of their job sites! Good hubby you have there! I will now be saving cans! These are so great and your pictures are fantastic. Beautiful! 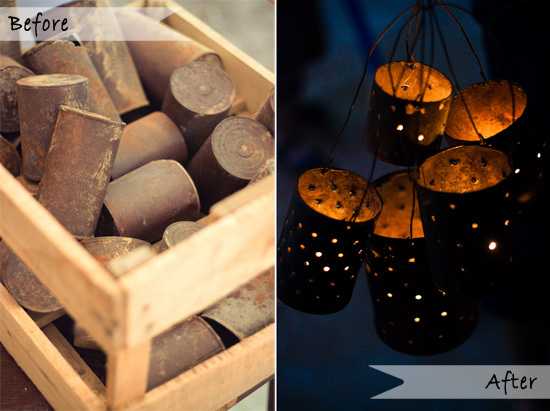 Who would’ve thought that something can be made out of old rustic tin cans?! I’ll make one myself soon.